After wrapping two new ulua poles, Brandon "Masao" Fujioka was looking forward to putting them to the test. He and his partner Shaun Yasay hiked 45 minutes in to a remote place on the east side of Kaua'i and put it to the lead. Masao's first strike was a big shark that wore him out. His second strike spit the hook, but the third time was the charm and he landed a 109-lb ulua on his freshly-wrapped 13-foot Nitro pole. 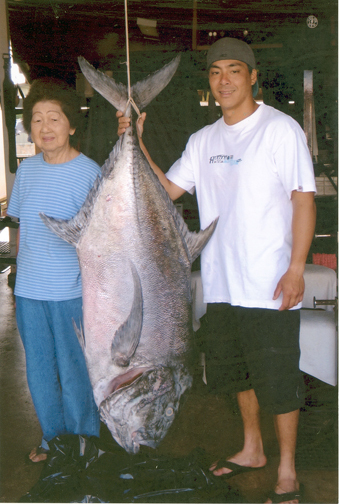 Masao used a Penn 4/0 reel loaded with 60-lb test Ande line to make the catch.